Ok, so it's really more green than shiny, but it is new! This will be our place to talk about website changes, and the wonderful world of free fonts. We hit 13,000 free fonts this month. Wow — a big thanks to all the designers out there who have shared their fonts for free. Also, thanks to fontologist who has been busy adding many rare fonts from the late 90's. We've got a lot of updates coming to FontSpace soon. The "add to favorites" will get a face-lift. 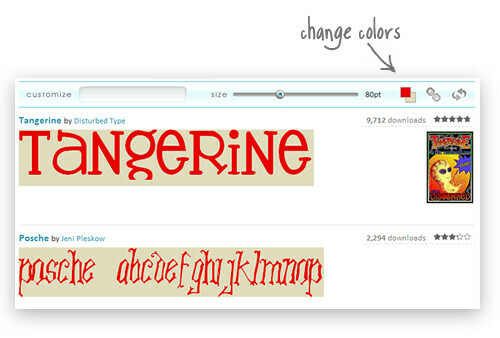 The popular fonts page will feature newer fonts as well, not just the ones with tons of downloads. Stay tuned and visit often to see the improvements. Here are some of the subtle updates we've made over the last few months. For all the pros out there it's 100x easier to find fonts with generous 100% free commercial-use licenses. Just click "Filter Options" and check the commercial-use box like the following picture. If you've used one of the fonts here in an image, share your design on the font detail page. This is great for designers who have lots of examples of their fonts in action. Check out Giro by Marcelo for an example. If you don't want to load up Photoshop for a quick splash of color, just click the color swatches on the customize bar. Click the chain-link icon to get a permanent link to your customized settings. This includes the Text, Font Size, and Colors. You can now contact any user by sending a private message. Just go to a user's profile and click the "Send Message" button. Your email address is not disclosed, no worries! If there's some new feature you'd like to see, please leave a comment below or contact us. We love feedback! That's Ecofont, a free font by the Dutch design firm SPRANQ based on Bitstream's public domain font, Vera Sans. You can download it at this site, which sells software that will put holes in any font . . . I would love to see a Facebook app to tie to my facebook page. What is the name of the font you used for the "FontSpace" logo? Every font I've tried to get off this site the last three times (at least 10 fonts each time) has been corrupted, they won't open, at all. Love This site!!! Love that I can put the exact wording and see it before I decide to use a specific font!!!!! Umm... I'm so excited to use this site because I LOVE FONTS! The ones here are so cool! But I can't get them to download and work on my Windows 7. Spent hours on Microsoft support and help forums to no avail... You guys obviously know how to do it? Please help someone who doesn't even know how to do a stupid avatar. Thanking you I am! Ok, I would love to put my own creativity to work making a font. How do I get started? Anyone anyone? Would love to hear from experienced font-ologists!!!! Hi, I was wondering if anyone could give me tips on how to upload a pic for my profile. I've chosen the picture and everything, but it won't show up on my profile. Help Please! Thanks! Is the font for the ST.Louis Rams anywhere here?? Can't get in. I get "invalid form of compression" for new fonts page. Just joined; previous forays to download free stuff and today's effort absolutely remain useless at downloads when I get notices that downloads are damaged and wont download. Site useless to me. Okay, I extracted the font, but it's not in the FONT folder, its in another folder, and I can't figure out how to move it (it's not one of the options when I click "move"). What should I do? How do I get it into the fonts folder? Please help me, SOMEONE. The popular fonts page will feature newer fonts as well, not just the ones with tons of downloads. Stay tuned and visit often to see the improvements. I am not sure how to use them after I downloaded them. Will they just appear in my windows and mac programs as a font option????? how do i use the font in windows after i download it ?? I have signed up, downloaded the FREE fonts, and also have downloaded some 'detective' fonts. My question is how to GET TO and USE the 'detective' fonts I downloaded. Thus far, I can only 'see' them. Anybody knows the name of this font ?